Hotel Music Road Resort Hotel is nestled in a quiet spot next to the Little Pigeon River minutes from the Titanic Museum the Tanger Outlet Mall and Dollywood. Guests enjoy being in the center of Pigeon Forge while staying in a clean and friendly Resort. Relax in an inviting guest room or suite featuring a private balcony and home comforts like complimentary Wi-Fi microwave and mini-refrigerator. Enhance your stay with an in-room Jacuzzi a fireplace or both and a view of the Great Smoky Mountains. Guests enjoy our complimentary breakfast heated indoor pool hot tub and outdoor Water Park with corkscrew slide mushroom fountain and lazy river. Other fantastic hotel facilities include a business center fitness center and two arcades. 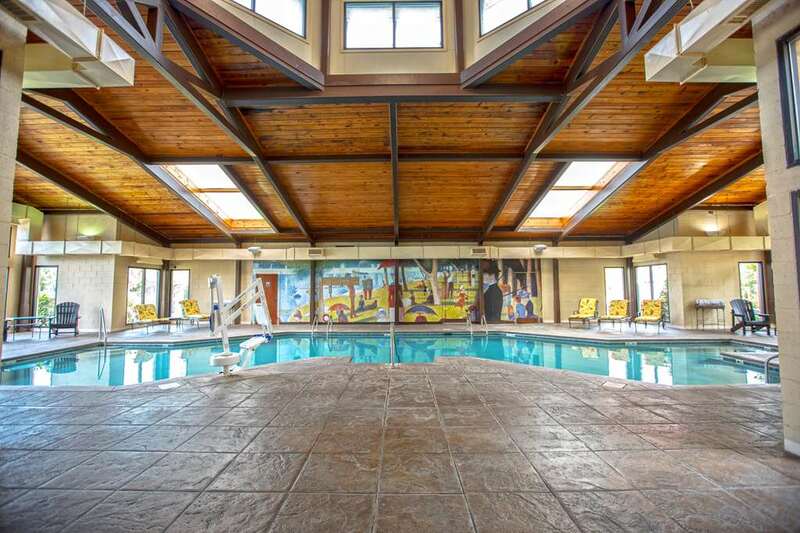 Inn Music Road Resort Inn is a tastefully appointed building with 140 family-friendly guest rooms and suites where you can spend the day relaxing on your private balcony or in our heated indoor pool and hot tub open 24-7. Each morning enjoy our complimentary breakfast. Guests of all ages have fun in our outdoor Water Park with corkscrew slide mushroom fountain-kiddie pool and lazy river. Other wonderful hotel facilities include a business center fitness center arcades and flexible meeting space. The Inn is at the heart of shopping theaters and dining in Pigeon Forge. Local Goat-New American Restaurant: Local Goat is a New American restaurant with a scratch-made kitchen specializing in locally-sourced and sustainable menu items. Local Goat offers a wide array of appetizers jumbo wings awesome salads. hearty steaks chops fall-off-the-bone ribs and outstanding desserts. Music Road Resort is in the center of Pigeon Forge surrounded by 40plus family friendly attractions shows restaurants museums as well as 100Plus outlet stores. We are located just off the main Parkway in a quiet setting visitors love. Country Tonite TheatreCountry Tonight Theatre provides award winning top quality Pigeon Forge entertainment with singing dancing comedy gospel American patriotism and more filling this two-hour show. Dixie StampedeDolly Parton is Dixie Stampede Dinner Attraction is an extraordinary dinner show with thirty-two magnificent horses and a cast of top-notch riders. DollywoodAwarded one of the world is best theme parks with five best of the best Applause Awards and 2 Best Coasters awards Dollywood is an amazing experience. There is something for everyone with thrilling rides entertaining shows and master artisans. Great Smoky Mountains National ParkBreathtaking ridges of forest separate NC and TN in the Great Smoky Mountains National Park. World renowned for its diversity of plant and animal life the beauty of its ancient mountains and remnants of Southern. MagiQuest4 attractions in one - MagiQuest Pirate Golf The Vault and Odyssey. Journey on a quest in MagiQuest. Pirate Golf is 18 holes of interactive black light mini golf in a pirate village. In The Vault navigate through a room full of lasers. Ripley Aquarium of the SmokiesRipley Aquarium of the Smokies is an amazing family attraction - State of the art facilities with over 10000 exotic sea creatures in 10 themed galleries. The Island in Pigeon ForgeExplore attractions rides restaurants retail shops and more at The Island in Pigeon Forge a new and affordable family fun center and entertainment complex. Titanic MuseumThe Titanic Museum in Pigeon Forge lets you experience what it was like to walk the Titanic. Visitors can see more than 400 actual artifacts touch a real iceberg and take a self-guided tour with boarding pass of an actual Titanic passenger. WonderworksWonderWorks aka the upside-down house is an amusement park for the mind and features over 100 interactive exhibits. Tanger Outlets SeviervilleTanger Outlets Sevierville is where you will find the latest fashion trends your favorite brand names and incredible savings all in a shopper-friendly environment with views of the mountains.